ABBOTT PARK, Ill., May 8, 2017 /PRNewswire/ -- Abbott (NYSE: ABT) today announced CE Mark and first use of the new Confirm Rx™ Insertable Cardiac Monitor (ICM), the world's first smartphone compatible ICM that will help physicians identify difficult to detect cardiac arrhythmias, including atrial fibrillation (AF), to help guide therapy. Since CE Mark approval, adoption of the device has been strong and implants have occurred in 10 countries across Europe. 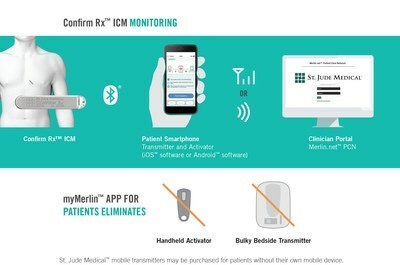 The Confirm Rx ICM is designed to continuously monitor a patient's heart rhythm and proactively transmit information via the myMerlin™ mobile app, allowing physicians to follow their patients remotely and accurately diagnose arrhythmias.